A bowl of tomato soup and a grilled cheese sandwich are true tokens of childhood. Although it may seem like an American classic, Poland, Spain, and many other countries have their own version of this refreshing soup. 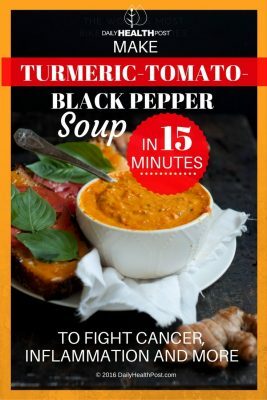 By adding a few token ingredients, you can elevate this soup into a powerful disease-fighting remedy. Plus, it only takes about 15 minutes to make! The major root of all disease is chronic inflammation. Of course, inflammation is part of regular immune response but eating acidic foods, being stressed out, and not exercising enough can cause inflammation to get out of control (1). Conditions like arthritis, asthma, cardiovascular disease, metabolic syndrome, hypertension, diabetes, inflammatory bowel disease, and even multiple sclerosis are all linked to inflammation (2). Luckily, inflammation can be kept under control through a few changes in your diet and lifestyle. By choosing the right foods, you can actually eat your way towards better health. These simple ingredients are the key disease-fighting elements in the recipe below. Turmeric is an orange root similar to ginger that has the ability to fight inflammation (3). 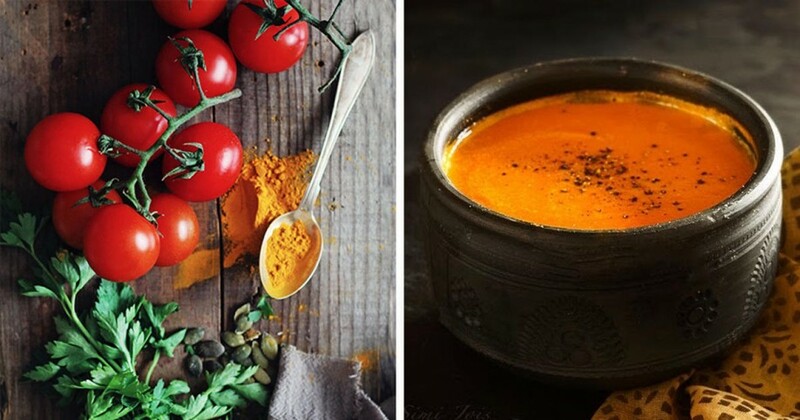 Its active compound, curcumin, has powerful anticancer benefits and can even stop the progression of breast cancer, colon cancer, leukemia, and melanoma (4). This golden spice also has the power to protect the brain from inflammation and toxins and treat depression (5). Other medicinal uses include its ability to indigestion, ulcerative colitis, liver problems, arthritis, and improve cognitive function (6). Black pepper fights inflammation on its own by it also increases the bioavailability of curcumin by up to 2000% (7,8). Heating up the spice and combining it with a healthy oil also increases its absorption rate.